Pipe manufacturing involves a great deal of science, from working with complex chemical formulas to employing various other disciplines for tasks that help make final products perfect. Hydroseal Canada has significant experience in the cutting edge of scientific pipe design and manufacturing, and more importantly, we extend our experience to others through promoting the open availability of our laboratory results. Offering partners, distributors, and end users the ability to clearly and quickly gain valuable insights on our products and their applicability to a wide variety of projects, our laboratory results empower people to make more confident piping choices and to gain a greater understanding of how pipes are created –and how well they can stand up to the demands placed upon them over time. 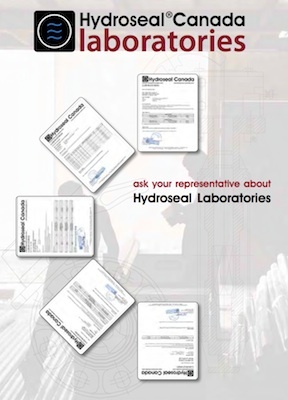 Hydroseal Canada offers its lab test results with a spirit of openness and professional responsibility, qualities emphasized by the easy accessibility of this critical information online. Interested viewers can see our results in an easy-to-read format, allowing for quick reference among those familiar with laboratory specifications, and those new to the world of pipe testing can enjoy a convenient, no-nonsense initiation with many opportunities to learn more about pipes, constituent materials, and various other points of interest related to the industry. With our freely available and clear laboratory information, understanding why our products are best-suited for today's most challenging applications –and for everyday use-- is a breeze. We envision a piping industry that embraces the free exchange of critical information and technological insights, rather than one focused on competition and adherence to outdated methodologies. Through our transparency on the science behind our piping products and accessories, we're showing that the best business is one that shares its expertise and performance with others, helping to accelerate the pace of positive change and foster deeper connections between designers, scientists, manufacturers, and users.